Kanpur: Thousands of doctors at hospitals across Uttar Pradesh are on strike to protest against what they describe as the “goonda raj” or lawlessness of the ruling Samajwadi Party. They allege that on Friday, several doctors of a government hospital were beaten after a confrontation with a legislator of Chief Minister Akhilesh Yadav’s Samajwadi Party. On Friday night, Samajwadi Party legislator Irfan Solanki and his supporters allegedly accused doctors at Kanpur’s Halet hospital of mistreating a patient. In the violence that erupted, the police used batons. 24 doctors were arrested. Their colleagues point out that no action was taken against the politician and his supporters. The striking doctors say they will not return to work till a police case is filed against the Samajwadi Party legislator. They waved photographs today of alleged violence on doctors by the police and political workers. Irfan Solanki said he would “resign” if any evidence was found against him. Doctors on strike have also demanded the removal of Kanpur’s Senior Superintendent of Police, Yashaswi Yadav, for ordering the police crackdown on their comrades. Yashaswi Yadav has justified the police action, saying the doctors were vandalising the Samajwadi Party legislator’s car. “Yes, we beat up the doctors, that was the need of the hour. Had the police not intervened there would have been rioting,” he told NDTV. Doctors say that to please the Samajwadi Party, the police even registered fake cases against the doctors. They have asked the Prime Minister and the President to step in. 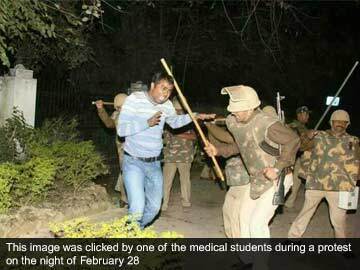 200 government doctors have resigned in Agra, in solidarity with their colleagues in Kanpur. Thousands of private doctors have also supported the strike which is now in its fourth day. Chief Minister Akhilesh Yadav has appealed to doctors to get back to work and asked for three weeks to investigate what happened. “The CCTV footage is available and will be probed. If the MLA is found guilty, we will take action,” he said. OPD and emergency services have been crippled in government hospitals because of the strike. The doctors are facing criticism from many quarters for not responding to a growing crisis, but they insist critical services have not been hit. The arrested doctors were granted bail this morning, but reportedly refused to leave the prison until their demands were met. Government officials say the cases against them cannot be withdrawn till the investigation is completed. This entry was posted in Uncategorized and tagged Cardiac, Cardiothoracic, Doctors protest Samajwadi Party's alleged 'goonda raj': mass resignations in Uttar Pradesh - India, Dr, Dr Sanjay Kumar Cardiac Cardiothoracic Heart Surgeon India, google, Heart, India, Kumar, Sanjay, Surgeon, yahoo. Bookmark the permalink.